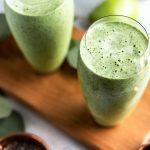 A simple and healthy recipe for making an Easy Green Apple Smoothie, with lots of spinach, healthy fats, fiber, and refreshing green apple. Can I take a second to rant about a pet peeve of mine? Mall smoothie stands. I LOATHE them. There you are, dead on your feet after scouring the sale racks in Anthropologie, Sephora, Nordstrom, and whatnot and you just want a cool, refreshing and light snack. You forgot to pack a little bite to eat in your purse (HELLO one must travel light to the mall), and you spot a smoothie booth. “Oh, a healthy snack”, you think. 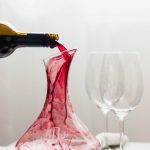 One sip later your scrunching your nose up in disbelief. That sugary thing just can’t be healthy. 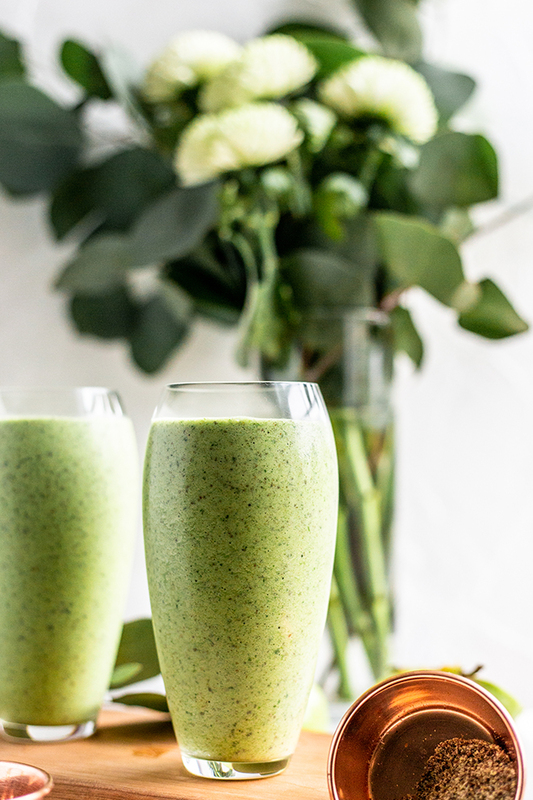 I love to indulge from time to time, but if I’m spending money on a healthy, produce-filled smoothie, I want it to have some nutritional value without the added sugar. You can’t tell what type of syrups or liquids they’re putting in those mystery cups and gosh knows what’s in the yogurt. I guess my pet peeve lies in the imposter. Or the company trying to hoodwink us into thinking they have a rejuvenating product, but then we find that it’s filled with artificial ingredients after purchasing. I’m also saying that I use smoothies as vehicles to add extra nutritional content to my daily routine. I’ve found that the combination of a frozen, very ripe, banana and nut milk makes for a very creamy and perfectly sweet creation. I now prefer my smoothies without dairy or yogurt. Fresh spinach also has the ability to adapt to its environment. You’re going to FREAK when I tell you how much spinach is in these guys, but I promise that it doesn’t taste like a salad. I’ll give you a few optional add-ins but this template is foolproof on its own. Love smoothies? Check out this Mocha Sweet Potato Smoothie! *My blender is NOT high powered (think a $30 blender from Costco), and this does the trick for a thick smoothie likes this one. 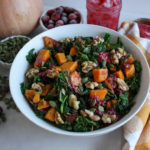 This recipe was published in March 2017 and updated in June 2018.
gorge allie! i totally agree on those mall smoothies…actually about any food at the mall. if i’m gonna treat myself, you better believe i’m gonna TREAT myself! I can barely get smoothies out anymore because I know there are filled with way too much crap that I don’t want. 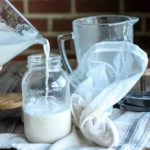 Most of the time the almond milk they use is sweetened and that alone is so much sugar already! Right?! If I want a treat, I’ll get a treat, but when I’m drinking a smoothie it’s usually because I need something nutritious fast! yum! you’ve totally built my ideal smoothie! I had a revelation smoothie this morning – I added cinnamon and tumeric *gasp* and it was amazing! pretty sure everyone on the bus was looking at me werid for having a green smoothie for breakfast! Ohhhh that sounds life changing! And let ’em look, right?! I couldn’t find measurements?? Did I miss it somewhere in the post? 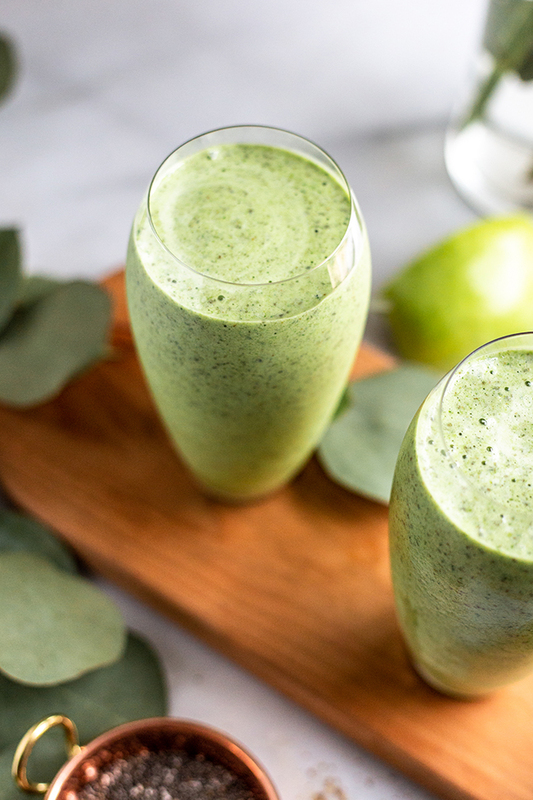 The apple drowns the taste of spinach and it is just great! Thanks for sharing! Hello Allie! Thanks for a great recipe. I am sure that with such healthy ingredients as spinach, almond milk, and chia seeds, all healthy lifestyle supporters will love it! 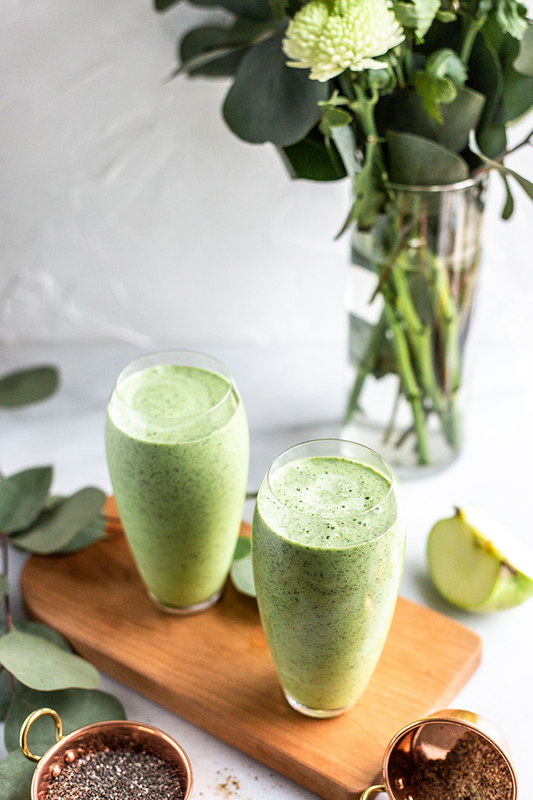 I also love green smoothies and juices, and spinach is my favorite in all these recipes. Good simple green smoothie recipe. I use ground flaxseed and chia seed a lot in smoothies. I agree that most smoothie stores sell smoothies full of sugar and fruit juice that it ends up being as many calories as a meal at McDonalds. Anna recently posted…Magic Bullet Review – How did it perform in our tests ? I will never go back to store bought smoothies, This one looks so delicious, it will def go on my ”to make” list.The only think I would add is lemon juice, yummy! I’m so glad it looks yummy to you!